How to stop the spike in NYC Gun Violence? How to stop the spike in New York City gun violence? In 2015, there was a spike in New York City’s gun violence crime rate. 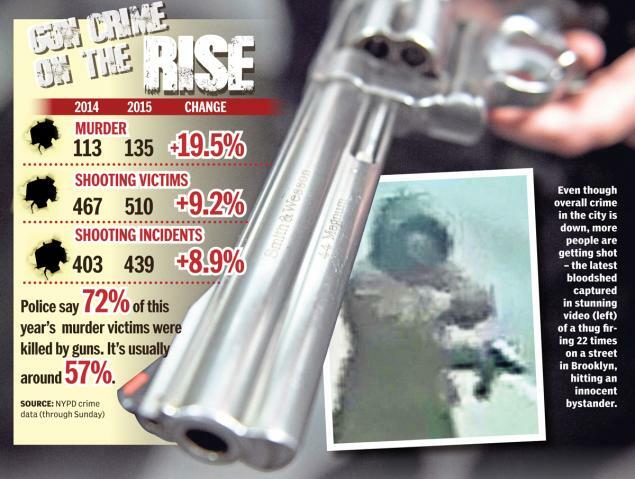 Murders were up 19% and shooting incidents increased nearly 10% compared to the same time last year. Many New Yorkers are alarmed and concerned. They want to know why the city’s youth are so violent, and more importantly, where are they getting all these illegal guns from? As the founder of Wheelchairs Against Guns, a nonprofit organization that conducts anti-violence workshops at NYC schools, I come into contact with inner city youth on a daily basis, so I would like to share my insights on these issues. I cant say for sure where all these weapons are coming from, but I can tell you from first hand experience, guns are as enticing to our inner city kids as a new pair of Air Jordan’s. And considering the number of incidents involving gun violence, it seems the guns are easier and/or cheaper to get than a new pair of sneakers. How can we begin to address this problem of gun violence? Social scientist say the violence amongst our youth is due to mental illnesses, but I don’t agree. I don’t want to label our inner city youth “sick” because I believe these issues stem from a lack of productive alternatives in their communities. Illegal guns and drugs flood lower income neighborhoods and the at-risk kids that need resources the most aren’t receiving any. Most are left without positive guidance and are looking for direction anywhere they can find it. Unfortunately, that usually means joining the neighborhood street gangs. These kids are constantly exposed to negativity and the threat of violence. In their world, it’s cool to be bad or not pursue an education. If we are to combat the onslaught of violence, we need to provide these kids positive activities and environments as a form of balance. At our workshops, we hear kids say all the time, how it’s hard to stay out of trouble when there is nothing else to do. There are few neighborhood community centers, and territorial gangs make it unsafe for most kids to venture into other neighborhoods where their may be a Boys Club or PAL (Police Athletic League). The strained relationship between police and the communities they are hired to protect and serve is a major obstacle that needs to be addressed. Most residents in NYC see police officers as the civil servants they are supposed to be, but to young black males, the NYPD represents hunters out to capture prey. As a young black male growing up in the city, I know from first hand experience how unfair cops can be when they are convinced you are part of the criminal element. I also know how easy it is for a kid growing up in the “hood” to develop an “Us vs Them” mentality. Even still, I am not naive enough to believe I have the answers to better policing policies or how to resolve the tension that exists between the cops and the community. But what I do know is this: if we had more positive programs (especially in troubled and high crime areas), we could keep more youth off the street. This would reduce their chances of being unfairly targeted, or even worse, unjustly killed by an officer — as we are hearing about so much in the news these days. The bottom line is, unless we provide alternatives for our city’s at-risk youth, the violent gun crime in New York City will continue to rise. Most New Yorkers turn a blind eye to this problem until it is splashed on the front page of the news, or even worse, there is a robbery or shoot out in their neighborhood. WAG is dedicated to protecting our youth from bullying, gangs, and gun violence. We conduct anti-violence workshops in inner city schools and churches to teach kids how to deal with potentially violent situations and peer pressure using critical thinking, conflict resolution, and self esteem reinforcement techniques. 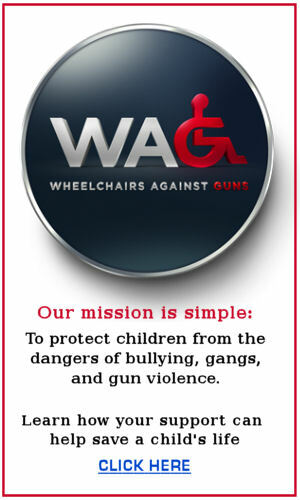 Wheelchairs Against Guns is a non-profit organization with a simple mission: To protect your child from the dangers of bully, gangs, and gun violence. Click here to learn how your support can help save a child’s life.